This popular and highly-rated shoot-em-up was originally developed and published for the Apple II computer by Dan Gorlin and Broderbund, respectively. The game was quickly ported to other systems including the C64, Vic-20, Atari 8-bit computers and consoles, ColecoVision and MSX. Following the success of the game, a new arcade version was released by Sega in 1985, and in 1986 this version was ported to the NES and Sega Master System. The player takes the role of a helicopter pilot and starts at his/her base. 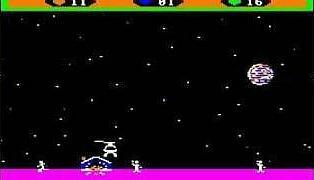 Unlike similar scrolling shoot-em-up games from the early 80s, the player flies from right to left. According to the Sega Master System manual, the chopper is named Hawk-Z, although there is no reference to this in earlier versions of the game. It can face three directions: left, right, or forward (facing the player). Impressively, you could shoot at enemies in any of these directions without actually facing them directly. The forward-facing mode was used mainly to shoot the enemy tanks. Before getting too trigger happy, you also needed to remember that your main goal was to rescue the POW hostages, therefore, you needed to avoid firing at them on the ground (at the POW camps) when attacking the enemy. In order to rescue these prisoners you had to first shoot one of the hostage buildings to release them, and then land to allow the prisoners to board your copter. Once done, you could return them to the starting point of the game. Each POW buidling held 16 hostages and all of these passengers could be carried in one trip time. With several buildings on each level, you would need to make several trips to rescue them all. I remember that each trip became ever more risky than the previous one, as the enemy became wise to your movements and was ready and waiting with a counter-attack. As well as shooting a hostage by mistake, you could accidentally land your chopper directly on top of a prisoner (unsurprisingly, this would immediately kill him/her) or completely block the building exit and kill all of them! In the Apple II and Atari 7800 versions hostages would also die if the vehicle was not landed correctly (e.g. if slightly tilted), being crushed as they attempt to board the chopper. Even when you had landed, you had to be alert to the fact that your helicopter could be attacked by the enemy tanks, and the only way to shoot at them was by returning to the air. Occasionally, the enemy would also scramble jet fighters which could attack you in the air with missiles, or on the ground with bombs. The concept of Choplifter! 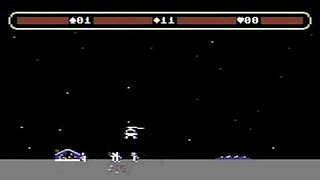 had some similarities to the 1981 classic Defender, which was also a sideways-scrolling shoot-em-up that involved shooting at alien enemies and protecting astronauts. Although the idea of the game was far from original, the gameplay, graphics and animations were all very decent and this led to high praise from the majority of gaming critics. Above all, it was fun to play, and the responsive, simple controls allowed just about anyone to get into the game pretty quickly - a true gaming classic from the first half of the 80s.